Mr. Underdown has experience as a Risk Manager dealing with large fleet programs varying from municipal fleets of police, fire, and public works to a nationwide fleet of ambulances. As a rule, such large fleets are self-insured for the first party vehicle physical damage, although in some instances it is possible and advisable to provide catastrophic coverage for groups of vehicles either parked or stored together. Mr. Underdown has experience as a Risk Manager dealing with large regional and nationwide liability programs for public and private corporations. It is generally easier to initiate a self-insured program for non-vehicle liability coverage because there are no financial responsibility laws with which to comply. The main caveat is that the reserves for claims and expenses need to be adequate for the risk assumed. As a Risk Manager, Mr. Underdown has experience dealing with large self-insured property programs varying from municipal exposures to a nationwide network of small local offices. As a rule, such property exposures are largely self-insured or insured with large deductibles or annual aggregate deductibles. It is possible and advisable to provide catastrophic coverage for certain property exposures, particularly facilities like corporate headquarters. 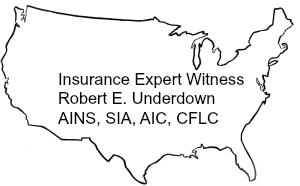 Mr. Underdown is experienced with self-insured workers’ compensation programs in a variety of industries, from banking to grocery stores and also public entities, including police, fire and public works employees.